Want to get a real taste of the South, sans roadtrip? 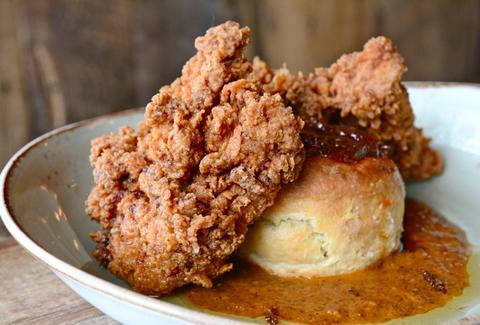 Trust these 14 recommendations from bonafide Southerners living in DC. We assembled a hungry panel of folks hailing from Tennessee, Kentucky, Alabama, Georgia, North Carolina, Arkansas, and Louisiana. They may live in DC, but they know Southern charm when they see it. Florida Avenue Grill has been getting soul food right for 70 years. Damn straight, they were making that killer sweet potato pie back in 1944! Arkansas native Brock Thompson says, "It’s a great place, frozen in time." 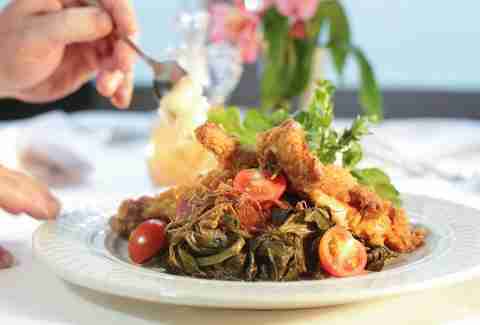 Their home-style dinners include fried pork chops, chitterlings, and baked chicken with cornbread dressing. But that’s not all. 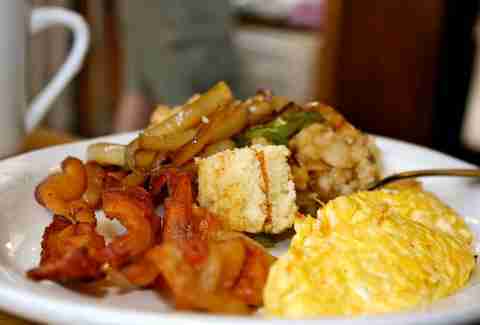 Get in on their all-day breakfast with options like fish & grits, a spicy half-smoke sausage with two large eggs, and their "world famous hotcakes". It’ll fill you up with good feelings. Our Southern experts pegged Marvin for the best iteration of chicken & waffles. 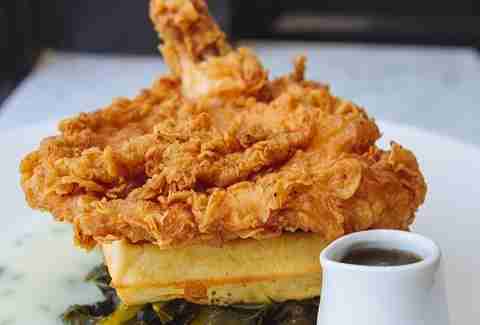 Crispy free-range chicken sits on a golden waffle and a mound of collards. Gravy completes the dish. Georgia native Tom Hayes says, "You have to get this dish right to pass as Southern." You’ll find it on the brunch menu. Marvin combines the best of the Belgian world with the best of the South, based on Marvin Gaye's two years in self-imposed exile in a small Belgian town. Kentucky native Tara Gabaldon fell in love with this Derek Brown bar when it hosted a "Kentucky Society of DC" dinner. But dining isn’t limited to Bluegrass State fare. The menu captures all sides of Southern cuisine, which is important to Brown. "Southern food is shorthand for regional foods coming from geographically and culturally diverse places," he says. "There are rich, poor, Black, White, Hispanic, and multicultural Southerners — their food traditions shape Southern cuisine into the wonderful trove of recipes that it is." Try the biscuit brunch! Oohh’s and Aahh’s are the sounds Southerners make when they feel right at home at this U Street soul food authority. "You have to get their mac and cheese and BBQ chicken wings, but from there you can play around." This sage advice is from Georgia’s Lukas Smith. Arkansas’ Brock Thompson agrees, but says, "Try the fried pork chops, fried catfish, and collard greens -- oh gosh, those collard greens." Oohh’s and Aahh’s has received visits from Allen Iverson, Jay-Z, Kevin Durant, LaVar Arrington, Lebron James, and other big names who get good food. Let’s be real. 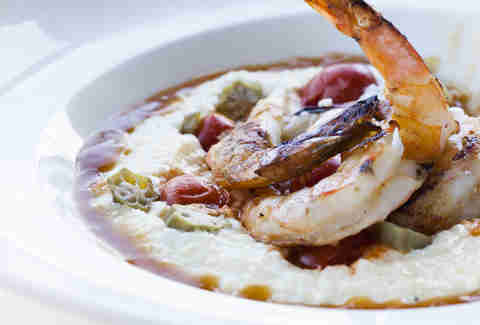 When it comes to Southern food, shrimp and grits are hard to top. Not only are they delicious, but a well-executed version says "yeah, we know what we’re doing". Tennessee’s Elizabeth Parker proclaims that Evening Star Cafe gets it. "The shrimp and grits are wonderful, because they actually use Tasso ham, and okra, which any good Southerner will tell you is the best vegetable," she says. Also try Chef Jim Jeffords’ fried chicken sliders on the lounge menu. "The shrimp and grits and the lemon chess pie are the real deal," according to Louisiana native Ryan Rupe. 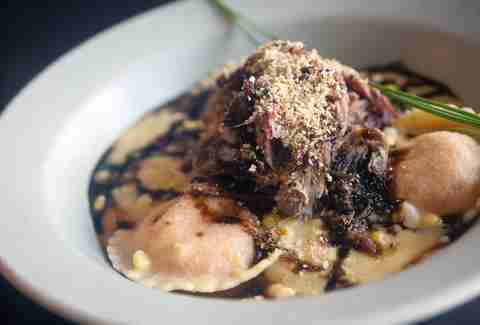 He’s crushin' on the Chef Jeff Buben restaurant. "Vidalia is still far and away the best Southern-style restaurant the city has; everything is consistently stellar and worthy of its higher price point." 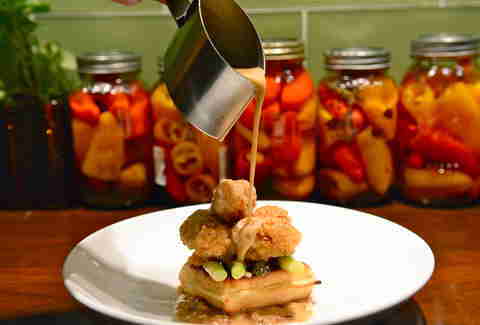 One next-level treat is the restaurant’s chicken-fried veal sweetbreads, served with a kabocha squash waffle, bacon fondue, and lemon caper veal jus. Just forget that it’s thyroid and dig in. Three words: pimento cheese ravioli. These pure bliss bundles are topped with charcoal slow-roasted goat, making it a must-order at Jackson 20. Bring your appetite, so you can also try country ham & corn fritters, Vidalia onion soup with bone marrow toast, and pickled fried okra. 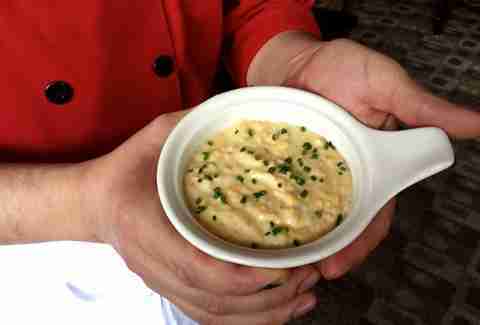 As far as deviled eggs go, they nailed it, according to Kentucky’s Tara Gabaldon. "They’re hard to mess up, but the mayo ratio has be on point," she says. Head to Acadiana for a blast of the bayou. Chef Jeff Tunks not only worked in New Orleans for a number of years, but he also continues to do research. The guy managed to hit 20 restaurants in four days in NoLa, and followed with another 10 on the Bayou. 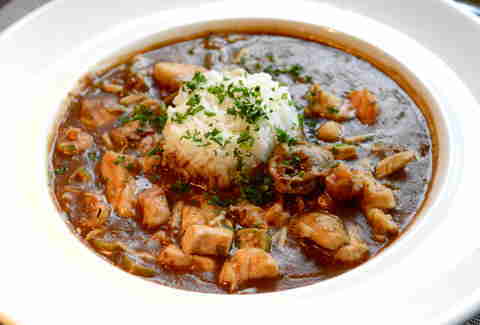 A bowl of Acadiana’s Louisiana seafood gumbo is like gulping the gulf, because it’s loaded with jumbo lump crab, shrimp, crawfish, oysters, redfish, and Mahatma long-grain rice. Go for lunch to try six different po’ boys, all on bread flown in from Leidenheimer Bakery in New Orleans. DC now has a Middle Eastern cocktail pop-up. You read that correctly. Tennessee native Elizabeth Parker digs Beuchert’s, and loves the hospitality and the portion size, too: "Sometimes you just want a frickin' entrée in this town." 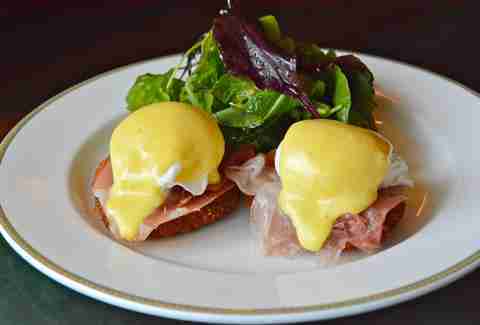 For brunch, opt for the Eggs Benedict, because Chef Andrew Markert replaces English muffins with fried green tomatoes. If you’re like Elizabeth, the dish will "make your whole world explode." The spot has history — the original Beuchert’s Saloon was built back in 1880, and served as a speakeasy during prohibition. "It’s an atrocity that there are so few properly prepared biscuits in this city; we’re afraid of lard, shortening, and butter it seems," says Georgia native Lukas Smith. "Barrel on Capitol Hill gets it right. They also fry chicken the right way." The bourbon bar has a Charleston, SC chef in the kitchen cranking out what Lukas calls "modern touches on classy Southern food." 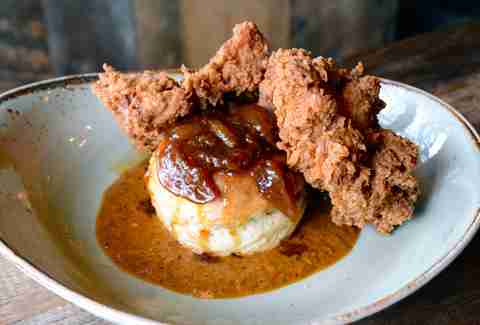 He even likened Barrel to Hugh Acheson’s 5 & 10 in Athens, GA. Don’t miss the fried chicken with smoky sausage gravy, biscuits, and blood orange jam. Finger-licking good BBQ is Southern food at its best for some of our experts, and DCity Smokehouse was name-dropped left and right. 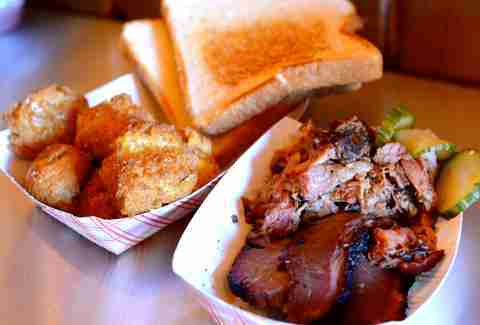 Grab some meat by the pound paired with a side of hushpuppies, or explore the between-the-bread masterpieces like the "Meaty Palmer", named for its half-smoked turkey, half-pork belly composition. The smashed avocado & jalapeño aioli make it way better than Arnold's version. Louisiana’s Ryan Rupe says do not miss the giant hushpuppy filled with rock shrimp at Eatonville. The ball of love is the perfect appetizer. He hearts other nods to Who Dat land, including a gumbo brimming with crab, rock shrimp, Andouille sausage, fried okra & white rice, as well as jambalaya. 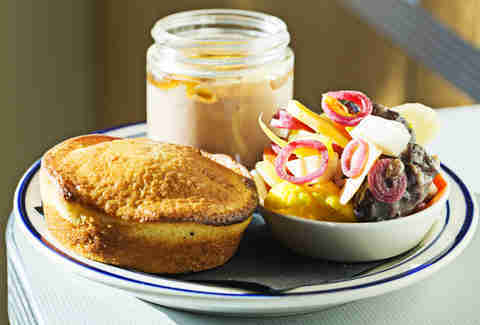 The expansive Southern restaurant is inspired by Zora Neale Hurston, a trailblazing African American author. Their Eyes Were Watching God was probably on your summer reading list. 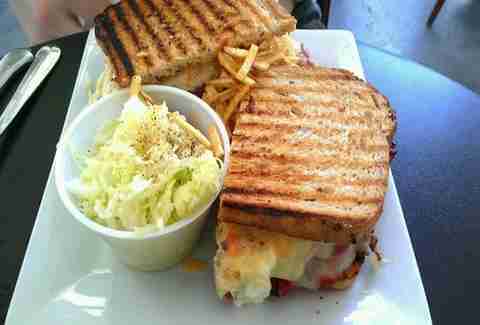 You know Iota for their live music, but don’t be afraid to bring your appetite. Tennessee’s Elizabeth Parker says it reminds her of Nashville. She digs their Carolina fried chicken and collards, plus any of their "smashers", aka sandwiches. They also do brunch, and the star of the show is their "Generous Breakfast Bread Pudding." It’s capable of soaking up the previous night’s shenanigans. 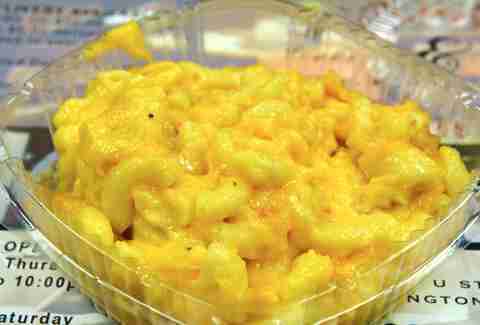 Bring four friends to this soul food staple. That way, you can spring for the Ma Brown’s appetizer sampler, boasting fried green tomatoes, cornmeal-crusted cat fingers, bacon-wrapped blue cheese-stuffed dates, and truffled deviled eggs. It’s a culinary tour of the South on one platter. Chef Jim Jeffords from Evening Star hails from Georgia and gave a glowing recommendation of the Charleston Perlau: a pile of Carolina red rice, Andouille sausage, duck confit, scallions, jumbo shrimp, and cornbread crumble. But be ready to tackle head-on shrimp, head on.